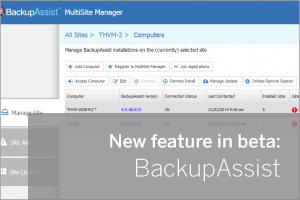 BackupAssist MultiSite Manager Beta – Testers wanted! BackupAssist’s new product BackupAssist MultiSite Manager is now available for download as a beta, and the Australian developers could really do with your help to test it! The MultiSite Manager introduces a suite of new, powerful and advanced features to simplify the remote management of your BackupAssist installations.